Looking for a thread for previously released Creatures? Check out these threads in the Fantasy Forest Story | Creature Library forum. Post any questions you have regarding the game in Fantasy General Question thread. Post any questions you have regarding breeding in Breeding Combos and Questions thread. Brag about your creatures in the Ultra Rare Breeding Bragging thread. What are your frustrated breeders? Share your frustrations in the Frustrated Breeders thread. Post messages to your neighbours in Post important messages to Neighbors thread. Need more neighbours? You can add your Storm8 ID and find others looking for neighbours in the Add Me forum. Post in Fantasy Forest Story | Bugs & Issues forum. If you are new to the Storm8 forum and like to know what are the dos and don'ts on the forum, please read the Forum Rules & Policies to find out more. Special thanks to Kooky Panda for previous Game Guide. Last edited by Rynetory2; 05-21-18 at 06:07 AM. Last edited by Rynetory2; 04-03-19 at 03:00 AM. Last edited by Rynetory2; 02-27-19 at 04:50 AM. Caring for animals is fun and rewarding, but they can be a handful, too! If you have questions about raising your animals and tending your island, this page can help you out. There are several important aspects to raising animals: Hatching Eggs, Building Habitats, Collecting Coins, Farms and Feeding, and Clearing Space. All animals come from a magical tree: the Tree of Life. The Tree of Life absorbs energy with its mighty roots and produces enormous eggs that hatch magic animals! To hatch an egg in the Tree of Life, you can either buy an animal from the Shop, or you can breed hybrid animals with existing animals on your island. You also need an open Nest resting in the canopy of the Tree of Life. Don't worry though, because the Tree of Life starts with an open Nest! Step 1: Tap on the Shop. Step 2: Tap on Animals. Step 3: Choose the animal you want. In the Shop, you see how the animals look as babies; you'll need to feed them to see their adult forms! Step 4: Once you've chosen your animal, you need to tap an empty nest on the Tree of Life in which to put the egg. Step 5: It will take some time for the egg to incubate in the Nest. You can choose to finish now with Gems, or come back when it's done. Step 6: An icon will appear above the egg when it's ready. Tap it and see your new baby animal! But your new animal will need a home! Keep reading to find out how to build a Habitat. Animals are separated into types. The first three are: Fire, Nature, and Earth. You can tell what elemental type your animal belongs to by the symbol next to their picture in their habitat or in the Shop. Habitats are also divided by their elemental type. Your animals need to be placed in habitats of the same elemental type. Some animals have more than one element type. These hybrid animals can live in any habitat they share an element with! For example, the Fairy Ferret is a Fire and Nature hybrid, and can live in Fire Fields or Nature Preserves. Step 2: Tap on Habitats. Step 3: Choose the habitat you want. Remember: animals can only live in habitats of the same type! Step 4: Drag the habitat to where you'd like to place it. The construction area will turn green when you've found a cleared location. Then, tap the green check mark when you're ready to build. The habitat will be under construction for some time. You can choose to finish it right away with Gems, or come back when it's done. Your animal will quickly adjust to its new home. You can check up on your animal by tapping your habitat, then tapping your animal's picture from the buttons on the bottom of the menu. Animals aren't just cute companions on your island; they also earn you Coins! These Coins build up over time, which you can collect from your animals' habitats. Each animal in the habitat contributes to the earnings. The earnings build up every second, but each habitat has a coin capacity (a "cap") that it can hold. Once the habitat earns this much, it will stop getting more coins until you come and collect the coins you'd already earned. That means it's a good idea to collect often! To see a habitat's coin capacity, tap the habitat and then tap info. Animals begin their lives as babies (level 1), but you can feed them so they grow stronger. Every 5 times you feed an animal, it will gain a level. When it does, it earns you more money per hour! Feeding your animals is a great investment. If your animal can't eat any more food, it's probably time for it to evolve! Scroll down to the Evolution Flower section to read more about animal evolutions. Your animals are special though; they can only eat special magical fruit that grows on the island. So how do you get this food? You grow it on your Farms! Step 1: Tap on your Farm. Step 2: You'll see a selection of magic foods. Pick the one you want based on the cost and the time. Step 3: It will take time for the food to grow. You can choose to magically speed up the growing with Gems, or wait for it to finish naturally. Step 4: Once your food is ready to harvest, an icon will be displayed over the Farm. Tap it to collect your food, and it will be added to your total food count at the top of the screen. To feed an animal, tap a habitat then tap the animal's picture that you want to feed. Then tap the feed button and watch it eat! Each time you tap the feed button, it takes food from your total. As your animal grows stronger it will need larger amounts of food for each feeding, so be sure to keep growing plenty of food! You start with one Farm on your island, but if you'd like more, you can buy them from the Shop in the Buildings section. Your animals need a lot of wide open space for their habitats so they can run free! Unfortunately, your island is initially covered in trees, rocks, and scrubs. To make room for your new habitats, Farms, and other buildings, you need to clear these things away. You can tap on a tree, rock, or scrub to see the how many coins it takes to clear it. Once you tap the clear button, it will take time to remove the foliage. That should cover the basics for raising happy animals! There are many other fun things to explore on the island, including animal evolutions, playing with friends, Battling, and more! If you're interested in details about these features, please read the sections below. Last edited by Rynetory2; 10-26-17 at 08:41 AM. Before you can add Neighbours, you must first create a Storm8 ID. To create a Storm8 ID open the Social page from the Menu and tap the Invite tab. If you already have a Storm8 ID it will be displayed at the top of the page. If you do not have a Storm8 ID, you will have to sign up for one. Don't worry: it's free! Remember that when choosing a Storm8 ID, this is what you will give to other players if you want them to invite you as a Neighbour, so be sure that you choose wisely. For recovery of games, it is important that you set a Storm8 ID and password. Once you have done that, all new Storm8 games (including Fantasy Forest Story) installed on that device will be under this account. Last edited by Rynetory2; 10-26-17 at 05:23 AM. It's more fun when you play with friends and join in the community! The Community is composed of everyone who plays the game! 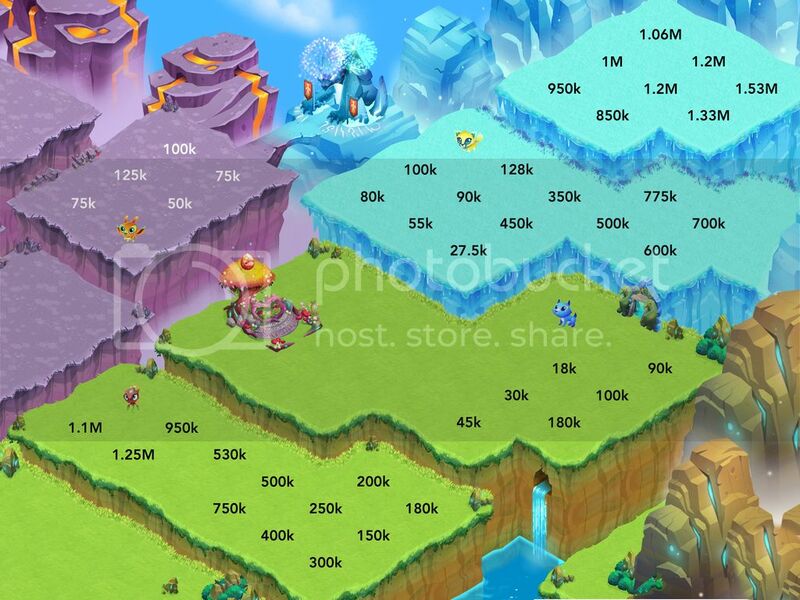 You can help members of the Community by visiting their islands gifting them Gems. To find members of the Community, visit the Social page from the Main Menu and tap the Community tab. From here you can view a list of several Community members and go to their islands by tapping the Visit button. When you visit another player's island, you can play with the animals there. When the Keeper you visited next collects from these animals, they'll get bonus experience and Coins, and your Social Rating will increase. Your Social Rating is displayed at the bottom of the island you are visiting and can range from 0 stars to a full 4 stars. A higher Social Rating increases your chances of appearing at the top of the Community list when other players are looking for someone to visit, which means there's a better chance Keepers will visit your island and play with your animals! Keep in mind that you can only play with animals in a limited number of habitats for each player that you visit per day. If you want to get a Social Rating of 4, you will need to help several Community members or Neighbors (explained in the Playing With Friends section) each day! You can add your Storm8 ID and find others looking for neighbours in the Add Me forum. Last edited by Rynetory2; 10-26-17 at 06:26 AM. To give a Gift to another player, you must first add them as a neighbour. You can then send a Gift either directly through the neighbours page by tapping the Gift button next to their name or by visiting a neighbour's island and then tapping the Gift icon on the right side of the screen. When you send a gift, you are not giving up items you already have, and it doesn't cost anything. It is like buying your friends presents for completely free! Your friends will surely appreciate that and return the favor, so try to send gifts to your neighbours every day! When a neighbour sends you a gift, a News icon will appear on your screen. Tap it to open it and accept or decline the gifts you've been sent. There will be an option to send a gift in return if you haven't sent that neighbour a gift that day. You can receive a gem from 3 neighbours every day. You can add your Storm8 ID and find others looking for neighbours in the Add Me forum. Expand to these land and be rewarded with a creature and habitat. I would recommend that you expand in this suggested order but you should adjust according to your preferences. See expansion goals in respective creatures links. Sinkstones - $18,000 - ?? Siphoning Cypress - $30,000 - ?? Toxic Sycamores - $45,000 - ?? Poisonous Pumice - $90,00 - ?? Wicked Thicket - $100,000 - ?? Immovable Rock - $180,000 - ?? Running out of space for your Creatures to frolic? It's time to expand your land! There are two ways you can expand your land. 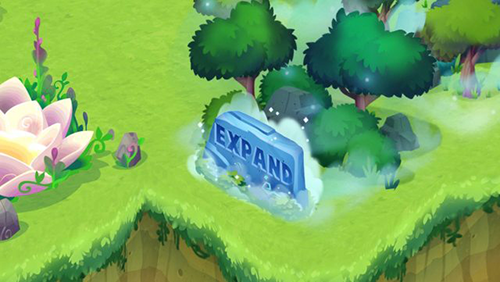 Tap on one of the Expand Stone signs in your Forest. Hit the Expand tab in your Shop. The first few expansions in your Forest will only cost you Coins. Eventually, you will need a new requirement, the Realm Rune, in addition to your Coins. Where can you obtain this Realm Rune? Check out the "Mining" post below. Once you have expanded to new locations, you will need to clear any trees or shrubs before you can place any of your Habitats or Buildings. 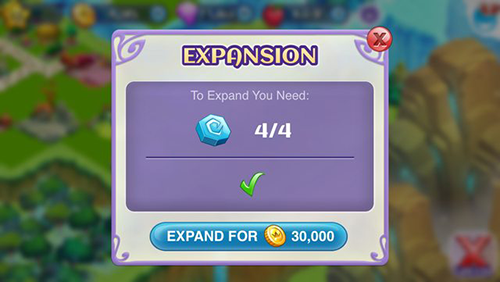 Note: You can only expand one land at a time. Last edited by Rynetory2; 10-14-18 at 10:12 AM. When you reach Level 3, you can build a Breeding Garden. The Breeding Garden lets you select two animals to breed new eggs! This is another way to get new animals besides buying eggs from the Shop. You'll want to try all sorts of different combinations to see what new animals you create. A pair doesn't create the same animals every time either, so be sure to keep trying! For example, a Pyro Pony and Pandaffodil normally breed to create a Fairy Ferret, but you could also get a rare hybrid animal from the same combination! You'll find the Breeding Garden in the Shop's Buildings section. To use your Breeding Garden, follow these steps. Step 1: Tap your Breeding Garden. Step 2: Tap on an animal in the left column and a different animal in the right column. An animal must be at least Level 4 to breed. While the animals are breeding, they will move from their habitats to the Breeding Garden. Step 3: Tap on Breed. This will require a small amount of coins. Step 4: The breeding will take some time. You can choose to finish now with Gems, or come back when the breeding is complete. Step 5: Return to the finished Breeding Garden. Tap it to get your new egg, then tap the Tree of Life to begin the hatching process. You can use the Breeding Chart to check the possibilities of your breed using the breeding duration and elements of your breeding pair. Breeding is an important part of bringing new Creatures to your enchanted Forest! You can select two of the existing Creatures in your enchanted Forest that are at least level four to breed in the Breeding Garden. The two Creatures that you select for breeding will create a new one together, combining the elements of the two parents. Try breeding different elements to create new and exciting Creatures in your Forest! After your Creatures have finished breeding, you will see a heart icon pop up above the Breeding Garden. This means you have created a new Creature! Tap on the heart icon to send it to the Tree of Life, where it will hatch and become ready to be placed in a habitat. 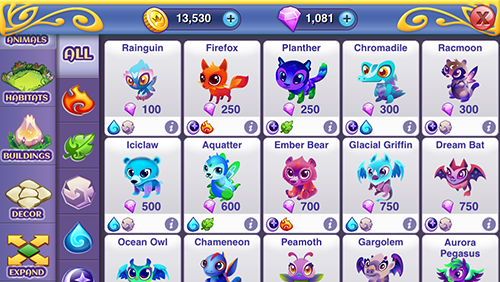 Different Creatures will have different hatching and breeding times, but you can also use Gems to speed up both breeding or hatching. Last edited by Rynetory2; 01-03-18 at 07:07 PM. As your animals are fed and get stronger, at certain points food will no longer be enough for them to keep growing. An animal needs to spend some time in the Evolution Flower to grow to its next stage. You can buy an Evolution Flower for your island from the Shop's Buildings section. To put an animal into the Evolution Flower, first you must feed the animal until the Feed button is replaced by the Evolve button. You can then tap Evolve! Alternatively, you can select the Evolution Flower first, then select the animal you'd like to evolve. The Evolution Flower will then wrap itself around the animal, and the metamorphosis begins! It will take some time for the evolution to take place, but you can always finish it instantly with Gems by tapping your Evolution Flower and tapping Finish. Once the animal is ready, tap the Evolution Flower and your newly evolved animal will be returned to its habitat. Discussion thread: What creatures to evolve? If you don't see the option to feed them anymore, it means it's time for them to evolve! Evolution unlocks the magical potential within your Creatures to upgrade them into an entirely new form. 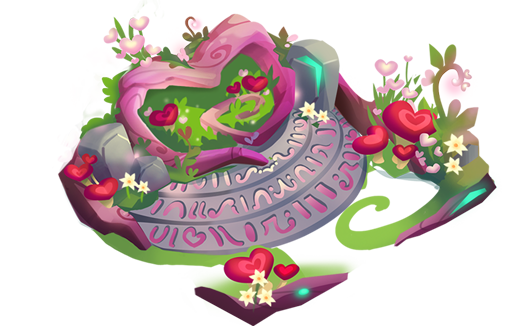 You'll need an Evolution Flower built in your Forest, which is where you can send your Creatures to evolve. After you have fed your Creatures all they can eat, you will see an option to evolve them in the animal's detail screen. You can also tap on the Evolution Flower to see all the animals in your forest that are ready to evolve. 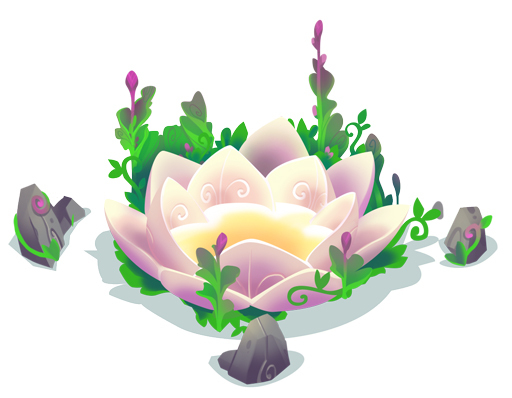 Once you've placed your Creature into the Evolution Flower to evolve, look for a flower icon to pop up! This means your upgraded Creature is done evolving and ready to be placed back in it's habitat. Once you've evolved an animal to level four, it can be sent to the Breeding Garden with another animal for breeding. Last edited by Rynetory2; 04-23-19 at 07:11 AM.